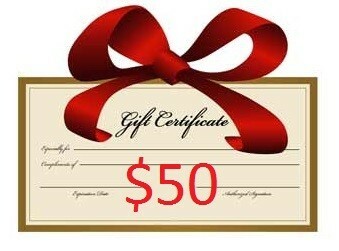 2JR Gift Certificates are the perfect gift for your significant other! Make them extra happy this year and let them pick exactly what they want. NOTE: cannot not be combined with Black Friday pricing and cannot be stacked. Must be used individually. Can be mailed or emailed for that last minute gift. Redeemable on all products listed on the website. Valid for 1 year from date of purchase. CHOOSE FREE SHIPPING WHEN CHECKING OUT! 2JR Gift Certificates are the perfect gift for your significant other! Make them extra happy this year and let them pick exactly what they want. Can be mailed or emailed for that last minute gift. Redeemable on all products listed on the website. Valid for 1 year from date of purchase.